Don’t let my name mislead you – My foster mom saw the “soul patch” on my chin and thought I needed a cool biker name, but soon found out that I’m not a tough guy at all. In fact, you can cradle me on my back and I might just kiss your face! Yeah, I’m just a big, cuddly marshmallow. I like to be brushed (which is important because I’m gonna have long fur when I grow up) and will even let you trim my nails. I ride well in the car, and get along with other cats and small dogs. I’d probably like a big dog just fine, as long as it was friendly. I’m a champ with the litter box, and know how to use a scratching post. I’m an all-around good egg, and am looking for a home where I will get as much love as I give. Oh, and one where I will get a new name. Enough with the irony already! I am 5 months old, fixed, vaccinated and microchipped. 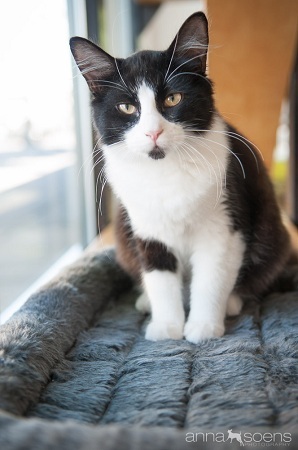 My adoption fee is $135 and I have moved into the Pixie Project cattery so come meet me today!